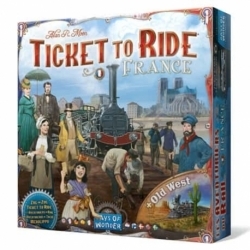 > Board Games>Ticket to Ride!>¡Aventureros al Tren! Ticket to Ride! is an adventure game by train. Players collect cards of certain types of wagons that allow them to connect different cities across the map. Ticket to Ride! is an adventure game by train. Players collect cards of certain types of wagons that allow them to connect different cities across the map. While longer the routes, the more points you earn. Who get fulfill their Destination Tickets by connecting two distant cities, and who gets to build the longest continuous rail route, earn additional points. October 2, 1900 - 28 years after the London eccentric, Phileas Fogg accepted a challenge that would earn him 20,000 pounds: to circumnavigate the world in 80 days. Now, at the dawn of a new century, it is time to take an even more impossible journey. Some old friends have gathered to celebrate the impetuous and lucrative gamble Fogg, and to propose a new one. The prize: $ 1 million for the winner. The bet: check who is able to visit by train more US cities in just seven days. That is the challenge of the first box to Ride You start with that box or to Ride Europe you are guaranteed to live the adventure Intesa can live on board a train. And of course, then you will be adding new maps with you on a journey around the world. Ticket to Ride! is an adventure game by train. Players collect cards of certain types of wagons that allow them to connect different cities across the map. The longer tours are, the more points you earn. Who get fulfill their Destination Tickets by connecting two distant cities, and who gets to build the longest continuous rail route, earn additional points. Path: Home > Board Games > Ticket to Ride! > ¡Aventureros al Tren!